Rick Greve is 59 years old and he’s been running for 13 years. 2019 will be his fourth year toeing the line in Hopkinton. Impressive for a man who didn’t start running until his mid 40’s. It was around that time while serving as a 7th-day Adventist pastor, he found himself in the midst of a job change, taking on a more administrative role. Traveling and helping churches find other pastors to replace ones that had retired. This prompted him to take up running. His first race was the Fireball 5k in Knoxville. “There was a vibe” at this race, according to Greve, where people seemed to be excited about racing and talking about doing marathons. Specifically, the Knoxville Marathon. Which was the spark that lit the match for him. “I wonder if I could actually do that,” he thought. According to Rick, this was initially the goal. Just starting and finishing a marathon was the dream. So, he chose the Marine Corps Marathon. His time? 3:45. Impressive for anyone in their late 40’s. At this point, he was 15 minutes behind qualifying for Boston. So, he attempted another race, which he finished in 3:42, but ultimately fell short of his goal. It was then that Rick started seeking coaching. 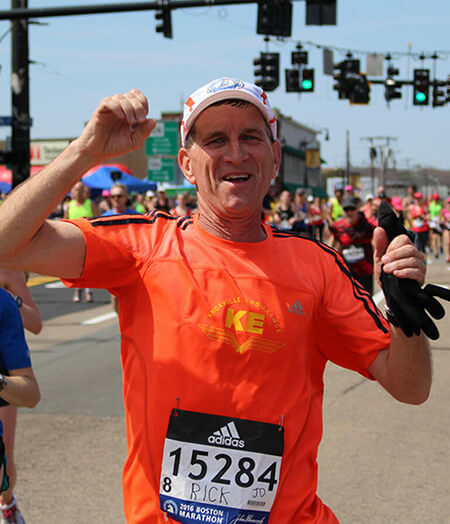 So, in 2014 at age 55, he signed up for training with Knoxville Endurance ran a 3:27 in Philadelphia in the same calendar year, smashing his previous personal record and qualifying him for Boston by 13 minutes. To this date, it remains his fastest marathon. While he may be 59, Rick can keep up with the younger crowd. 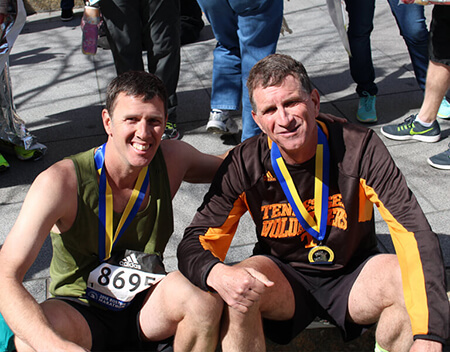 Last year, he ran the TCS New York City marathon with his son, which he ran simply for the enjoyment of it. You could almost say that running is fueled not simply by his fitness goals, but by the people and the experience of running itself. "Running looks to be a singular sport because you're the one putting in the work. But there are others around you who provide, I think, the emotional and spiritual support you need to accomplish things you thought you'd never be able to do." What keeps him coming back after 13 years? Everything from his faith to his family and the people he trains with is what ultimately gets Rick out the door every day.